This here's the latest for "The Boise Weekly". It's an illustration that will accompany an article about a colorful man by the name of Harley Brown, who's is an Idaho congressional candidate. 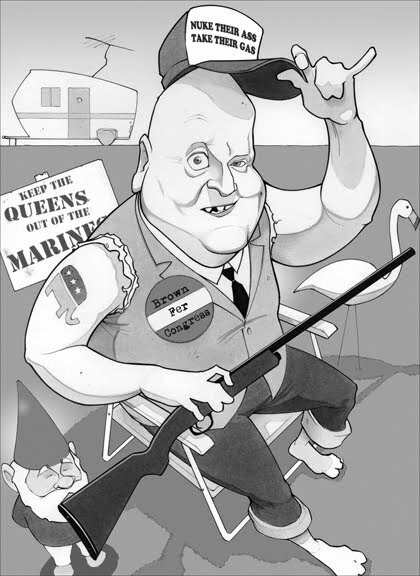 The phrases in the illustration (excluding "Brown fer Congress") are pulled from his website. I wish I was kidding. Under immigration policy, it simply says "Adios, Amigos!" I used to be an editorial cartoonist. In all fairness, I wasn't great at it. But I can't help but editorialize a bit here. Brown's chances aren't great. But that doesn't stop him from reinforcing the idea that everyone from Idaho is an uninformed hillbilly. Regardless of your position on the political spectrum, I think what we need now in politics are well-informed, intelligent, thoughtful candidates with platforms based on logic. What we don't need is another person with divisive straw-man arguments meant to angry up the blood. Ok, that's plenty of opinion. The illustration itself was intensely fun. And, giving credit to Brown, it wouldn't have been so if he were Al Gore. His face is already a caricature and his personality seems to be cartoonish as well. The garden gnome comes from my affinity for Rien Poortvliet, a Dutch illustrator I've always loved.